Earn up to 30,000 bonus miles when you travel the world like an operative. Offer applies to round-trip travel on American Airlines, American Eagle or the AmericanConnection carrier marketed and operated flights. Book your reservation between July 18 and September 15, 2012 and complete travel between September 4 and November 15, 2012. Not all fares are eligible. Fares booked in N, O and Q are excluded. Registration required before you travel. Use promotion code AABRN. Go here to sign up for this offer and to read the terms and conditions. Note: Keep an eye on the American Airlines Facebook page. 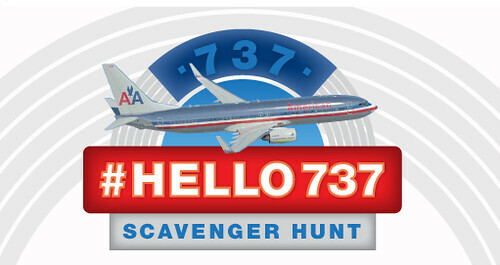 Not sure of the details yet, but they mentioned last night that they’re taking deliver of a new 737 today and that there will be some kind of scavenger hunt promotion with a chance to win some AAdvantage Miles. Update: It’s a Facebook scavenger hunt. You can play for a chance to win 50,000 AAdvantage Miles!! @ Sarah O. – I just got the same results. I’ve update when it’s working properly. Thanks for sharing the info! I only get “The promotional code you entered is not valid. Please contact AAdvantage Customer Service.” when I try to register. @ Matt – Worked for me too. Thanks for sharing the info!